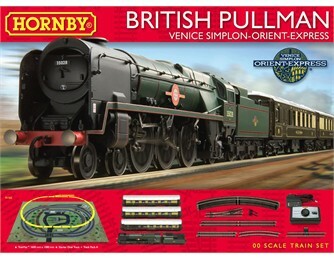 What a superb train set to receive as a gift or to give as a present! The wonderful opulence of travelling on the british pullman VSOE can be recreated in the world of model railways with this set. Not only is there a top of the range classic British model steam locomotive included but also three elegantly decorated pullman cars. The train runs on an oval of track with siding together with a midimat, which with the addition of extra Hornby track and building packs can be simply and quickly built up into a truly fascinating layout. The best eCommerce software by ShopFactory powers P985. All-in one eCommerce and shopping cart software.